Arunachal Pradesh Public Health Engineering and Water Sanitation (PHE&WS) Minister Bamang Felix on Tuesday said the State Government will take up the recommendations made by experts on menstrual hygiene in the State on a ‘mission mode’, the way it did in achieving the open-defecation status. 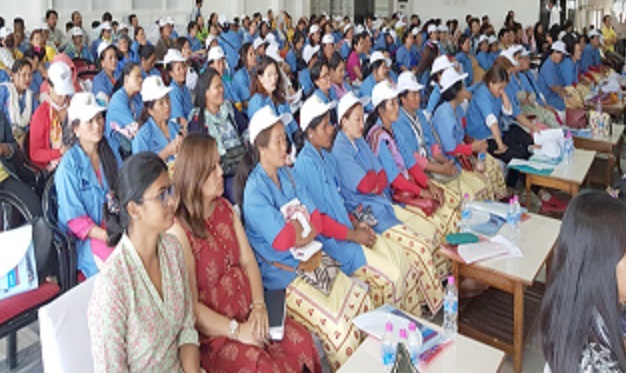 Felix said this while addressing the inaugural function of a two-day workshop on menstrual hygiene management, which began at the State Banquet Hall in Itanagar on Tuesday. He, however, admitted that there is improper supply of free sanitary pads to schools in the State, especially in the rural areas. Felix suggested that the participating doctors, accredited social health activists (ASHA) and resource persons should hold discussions and exchange ideas on all aspects of menstrual hygiene during the workshop, so that a mechanism might be evolved to tackle the issue. He also highlighted how open talks on menstrual health and hygiene could help spread awareness. He also called for carrying out intensive IEC (Information Education and Communication) activities with the support of the ASHAs. Earlier, a panel discussion was held between resource persons, Deane De Mendes – founder of Mumbai-based NGO Red is the New Green – and the NGO’s members Dr Kranti Rayamane and Dr Madhuri Rayamane, along with ASHAs and chief engineers of the department. Issued discussed were problems faced by them in educating people about menstrual hygiene, problems faced by adolescent girls, how menstruation is still a taboo even in the tribal society although it is a natural and normal biological process experienced by all girls and women, and how it is not spoken about openly.